Description: Vanilla plants are easily recognized by their climbing, vine-like appearance and spectacular but short-lived flowers. Flower: Spreading sepals and petals of these large flowers (to 4" [10 cm] across) are pale yellowish green to white. The forward-jutting lip, usually marked with orange or yellow, occasionally red to purple, has a ruffled outer edge and a sheath-like base that wraps the column. The long column is hairy underneath, with a large flap of tissue (the rostellum) covering the stigmatic area. Plant: A very elongated stem (to 40' [12 m] or more) twines up tree trunks and branches, clinging with aerial roots. Leaves can be large (to 9" [23 cm] and longer), shiny, and leathery, or so small the plant resembles a leafless vine. Inflorescences emerge from the leaf axils, bearing only a few flowers that wilt within hours of opening. epiphytes, throughout the world's low- and middle-elevation wet tropical forests. 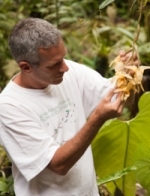 Ecology & History: Vanilla is the most important commercial product obtained from orchids. The flavoring, composed of vanillin plus more than 150 aromatic compounds, is produced through labor-intensive processing of vanilla "beans" (actually seed capsules: the tiny black flecks in natural vanilla ice cream are orchid seeds). 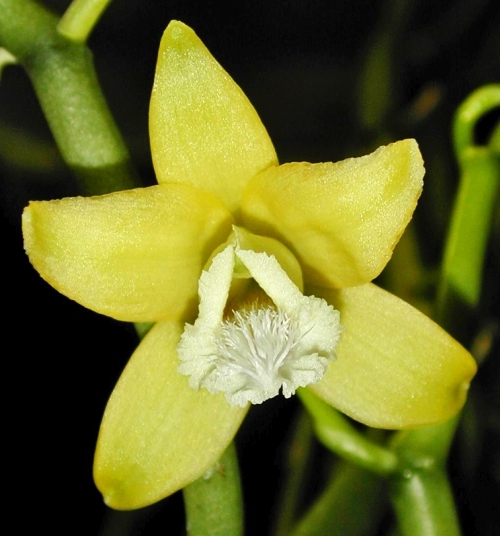 Commercial vanilla comes primarily from V. planifolia, which in the wild is pollinated by bees. Large-scale production was hampered until a slave named Edmond Albius discovered that lifting the rostellum with a sliver of bamboo permitted hand-pollination. Since his epiphany, most operations moved to Madagascar and Indonesia, together responsible for 80% of world production. With prices occasionally exceeding US$1,000 per pound, vanilla is the second-most expensive spice after saffron. The Aztecs mixed vanilla with cacao to make a sumptuous drink they called chocolatl. Spanish conquerors brought it home, and soon hot chocolate became popular in cafés across Europe. Thomas Jefferson shipped the first cured capsules to the United States and published his recipe for ice cream (1 quart heavy cream, 1 vanilla bean, 6 egg yolks, and 1 cup sugar). Vanilla, taken alone or in chocolatl, is reputed to have medicinal and aphrodisiacal properties: the Aztec emperor Moctezuma drank 50 pitchers per day, particularly before visiting his wives.